Fold3 has a search engine that is both simple and powerful. 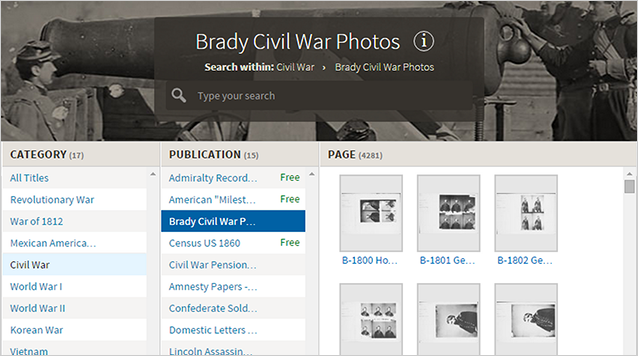 You can search on names, dates, places, publication names, conflict periods, document types, and more. It's best to start with a simple, broad search such as a name or keyword search, then narrow those results using dates, places, and the available filters on the left side of the page. For more tips on using Fold3 search, watch the following tutorials. The Browse tool is a great way to find information on Fold3 by allowing you to visually drill-down to find publications and documents that interest you. You can also search directly from any level in browse by using the Search box at the top. Searching from Browse automatically filters your search to only include results from the title you select. As you click on selections in the browse categories, you may see an Info button appear in the title box at the top. Clicking on this Info button will open up information about that title, including a description and details about the source. If you drill down to the Page level, selecting the thumbnail of a page that interests you will open it in the document Viewer for easier inspection. 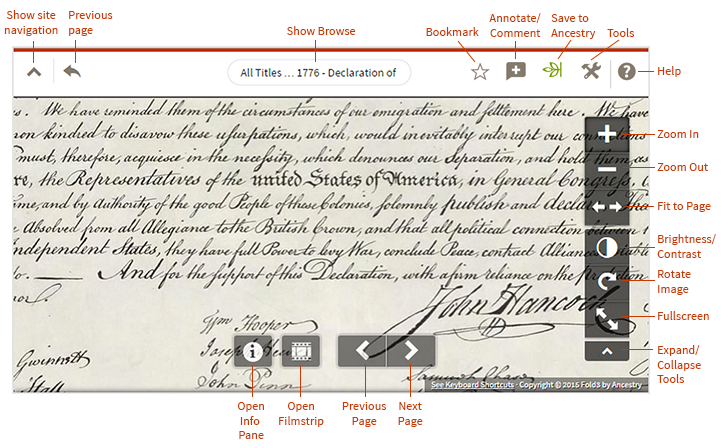 The Viewer has a built-in browse tool to easily navigate to other documents or images. Click on the oval image location box at the top of the Viewer to open Browse. Being able to explore an image or document in close detail is important to researchers and history buffs alike. The Fold3 viewer is a powerful tool that lets you explore, annotate, print, and save documents and images. When you find an image or document that you would like to print or download, you can do so from the viewer. Annotations make documents and images easier to find when using the Fold3 search. They also make it easier to find things on the page since annotations can be applied to a specific area of the image. Annotations can be flagged as Name, Person, Date, Location, Transcription, or you can add a simple Comment. You can view annotations to the images by opening up the Info pane at the bottom (Click the Info button near the bottom of the screen to open the Info pane), and click Contributions. Bookmarking an image adds the image to your Bookmarks list. It also adds the image to your Gallery. Note: You can click on the Bookmark icon again to remove the Bookmark. Fold3 makes it easy to save links to images directly from the Viewer. Log into Ancestry (Optional. If you are already logged into Ancestry this step will be skipped). Select the Tree and Person you wish to save the link to. The link to the Fold3 image will be saved on the Profile of the person selected, under Sources/Other Sources. Memorials are an excellent way to remember the People, Topics, Events, Places and Organizations from your past. 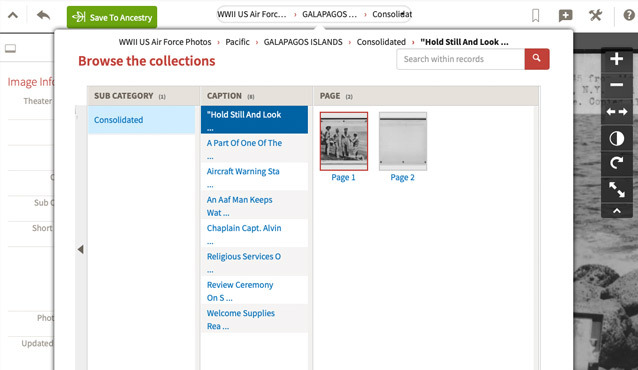 Fold3 has millions of Memorials created from our vast collection of records to give you a head start. You can add information to an existing Memorial or easily create a new Memorial from any record on Fold3. You can even create one from scratch. Memorials make it easy to share and collaborate with others, and you can make as many as you would like. Memorials also have the added feature of honoring military heroes from your family. Just add the military service information to a person Memorial and watch the page transform with conflict-specific backgrounds, military seals, flags and data. Fold3 then creates the Memorial and opens a Page Settings dialog. From here you can add a profile photo, assign a background photo, edit the title and description, and mark the page as being private if you would like. You also have the option of adding military information for person Memorials, which transforms the page into an Honor Page with conflict-specific backgrounds, military seals, flags and data. Clicking on the Edit button on the right side of the page opens a dialog that allows you to change the page Title and Description, update the Profile and Background information, and update privacy information. You can also delete the page using the Delete Page button at the bottom of this dialog. You can easily save a link to your Memorial on an Ancestry person page. Click on the Save to Ancestry button on the top of the page. If you are not already logged in to Ancestry, you will be asked to do so. Select the tree and person to which you wish to save the link. You can share your Memorial with friends via email, Facebook, Twitter, or Google. You can also embed your page elsewhere. Just click on the Share button at the top of the page, to the right of the Memorial title. When you create a Memorial, it is automatically bookmarked so you can easily find it later. From the top of the page, either choose Memorials and then Your Memorials or hover over your username in the top right and choose Bookmarks in the menu that appears. To add or remove a bookmark from a Memorial, click on the Bookmark icon at the top of the Memorial, to the right of the Memorial title. Facts are only available for person Memorials. important details for the person can be entered on the Facts tab, including vital information such as birth, death, and military details. Adding facts with specific names, places, and dates makes finding your Memorial easier for others. Click on the Facts tab at the top of the Memorial to view and manage facts. You must have a Fold3 account and be signed in to add or edit Facts. If a Memorial is marked as Private, only the owner can add or edit the Facts for that Memorial. From here you can select the type fact you want to add, then enter the value of the fact, such as a place of residence or a death date. You can also add Custom facts, which allow you to give your own name to the fact as well as providing a value. For example, if you want to add a fact for Christening Date, you would select Custom Date from the drop down, enter Christening Date as the Fact Name, then enter the date of the christening in the Custom Date field. A Military Event is most often associated with a conflict (like World War II, for example), and can contain multiple militarily related facts. Once you have added Personal Information and/or a Military Event, you can add additional facts of the same type by clicking on the + symbol at the right of the fact. For example, if you created a Custom Fact, you can add another Custom Fact using this + icon. If you added a Military Fact, clicking the + symbol will allow you to add another Military Fact for that conflict. If you want to add a fact that doesn’t match the type you’ve already added, you will need to follow the steps listed above. You can also edit and delete individual facts by clicking on the fact to expand it, then clicking on the appropriate icon to the right. Stories can be added to any Memorial and can contain formatted text, HTML links, and photos. You can also associate them with a location and/or a date. You must have a Fold3 account and be signed in to add or edit stories. If a Memorial is marked as private, only the owner can add or edit stories for that Memorial. For Topic, Event, Place, and Organization Memorials, the initial story is also displayed on the Summary tab. From the Edit Story dialog you can add a title or leave that field blank. Click on Add Text or Add Image to include a block of text or image with your story. You can even add more than one image to an image block to show them side by side. Near the bottom of this dialog are areas for entering location or date information, if applicable. Note that you can add multiple text and image areas within a single story. From the Edit Story dialog you can add or edit text or images. If you want to rearrange the order of text or images in your story, click on the item you want to move, then click on the arrow buttons to the right. Likewise, to delete entire text or image blocks, click on the item you want to delete, then click the Delete button on the right. To delete a story, click on the Delete button at the bottom of the story. If you don’t see the Delete button, you may not be signed in, or the page has been made private by the owner. Images can easily be added to Memorials by clicking on the Gallery tab at the top of the Memorial and clicking on the Add a photo or record box. Select from Recently Viewed images, or upload a new image by clicking on the Upload button. You must have a Fold3 account and be signed in to add or remove images. If a Memorial is marked as private, only the owner can add or remove images for that Memorial. Your Gallery is a great way to gather and organize images you have uploaded to or found on Fold3. You need at least a Basic Membership and be logged in to use the Gallery. To access your Gallery, click on your member name in the header, then select Your Gallery. Adding your own images to Fold3 is easy, free and a great way to preserve and share historical photographs or documents. Click the Upload to your Gallery button in the top right. Select one or many images from your computer. PC: Hold down Shift or CTRL while clicking to select multiple files. Mac: Hold down the Shift or the Command/Apple key. Choose whether you want to upload your images to your Gallery or to a specific Collection. Fold3 supports .jpg, .gif, .tif and .png images that are less than 10 megabytes in size. You will notice that once you click Upload Images, a progress bar and an estimated time to upload will be shown for each file while it is being uploaded. Once the process is complete you will see a confirmation message and a link to view them in your Gallery. Once the images are in your Gallery, you can edit their names, add descriptions and connect them to other images. The more detail you provide, the easier it will be for people to find what you have added. You can organize your images or group them around a theme using Collections. You can add an unlimited number of Collections with as many combinations of images as you need. Images in your Gallery may be added to more than one Collection. On the left side of the gallery is a Your Gallery link. Clicking on this link will display all of your images. You can create a Collection just by dropping an image onto the dashed box found in the upper-left corner of your Gallery. To select multiple images, hover over an image and check the Select checkbox when the bubble appears. You can add more images to an existing Collection by dragging images to that Collection in the list in the left column. You can rearrange the images in your Gallery by clicking the Arrange button and then dragging and dropping images into the place you want them. When you are done arranging your images, click I'm Done to go back to viewing and using the images in your Gallery. Each Member of Fold3 has a public Profile Page that displays basic information about them and a list of their contributions to the site. Profile Pages of other members can be a great way to find interesting information. When you see contributions added by other Fold3 members, you will see their image and member name next to it. Clicking on the Member name will take you to their profile page where you will find a full list of contributions they have made to Fold3. When you find other members with interests similar to yours, you can contact them to get more information or share an insight, if they have that feature enabled. You can manage all aspects of your account by clicking on your member name in the header and using the links provided.